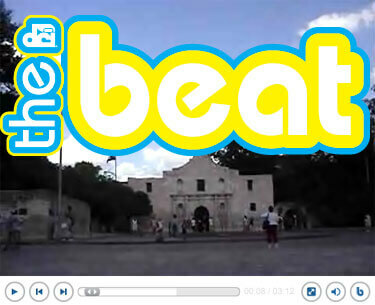 San Antonio edition of "The Beat." In the third edition of Drum Corps International's new video magazine "The Beat," get the lowdown on the 2006 DCI San Antonio Southwestern Championship, where the Cavaliers cowboy up and take the gold. Host Steve Rondinaro chats with several high school and junior high band directors attending the 2006 Texas Bandmasters annual clinic and convention, including a special visit from Tom Bennet and Eddie Green of the University of Houston. Also in this edition: See members of the DCI TV crew in action as they work in San Antonio to prepare for the 2006 DCI World Championships in Madison. All of this and much more. Choose your tempo, and get with The Beat!